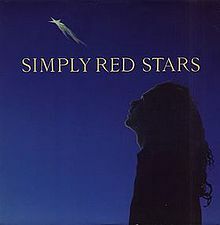 Stars is a single by the band Simply Red. "Stars" was originally released in the 1991 album of the same name. The single reached #8 in the United Kingdom and was successful in some other countries in Europe, but did not reach the Top 40 in the United States, unlike Simply Red's previous single "Something Got Me Started". However, the song did reach number eight in the US Adult Contemporary chart. The video to the track was filmed in Tunisia. Stars is the fourth album by British pop/soul/jazz band Simply Red, released in September 1991. Five singles were released from the album including the UK top ten hits "Stars" and "For Your Babies". Domestically it was a huge hit, becoming the best selling album in the UK for both 1991 and 1992 and according to the BPI certification of 12 times platinum, the joint 6th highest selling album of all time in the UK. Simply Red were a British soul band that sold more than 50 million albums over a 25-year career. Their style drew influences from blue-eyed soul, new romantic, rock, reggae and jazz. Since its early days the main driving force behind the band was singer Mick Hucknall, who by the time the band broke up in 2010 was the only original member left.